ABBOTSFORD — It’s happened precisely twice. That’s how many times over the first 73 years in which the B.C. 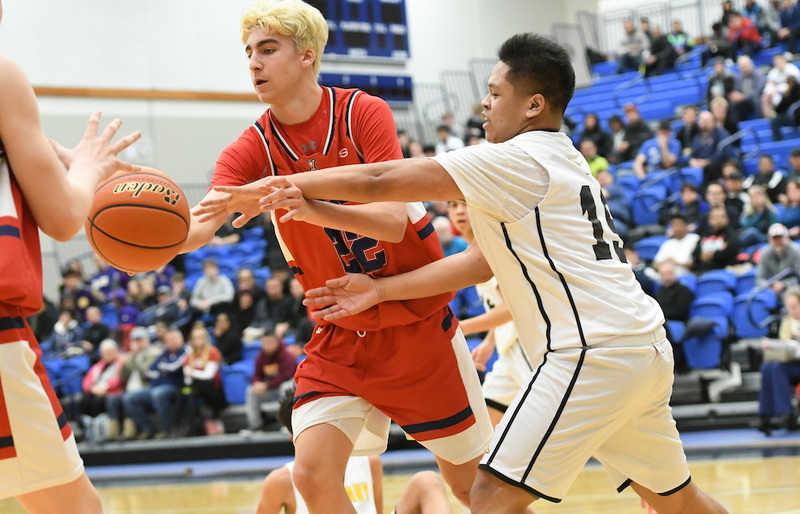 senior boys basketball championships have been staged that a school won both senior varsity football and basketball championships in the same academic year. We’re not pointing out that fact simply because four key members of the defending Subway Bowl B.C. Double-A champion Vernon Panthers happen to also play for its B.C. No. 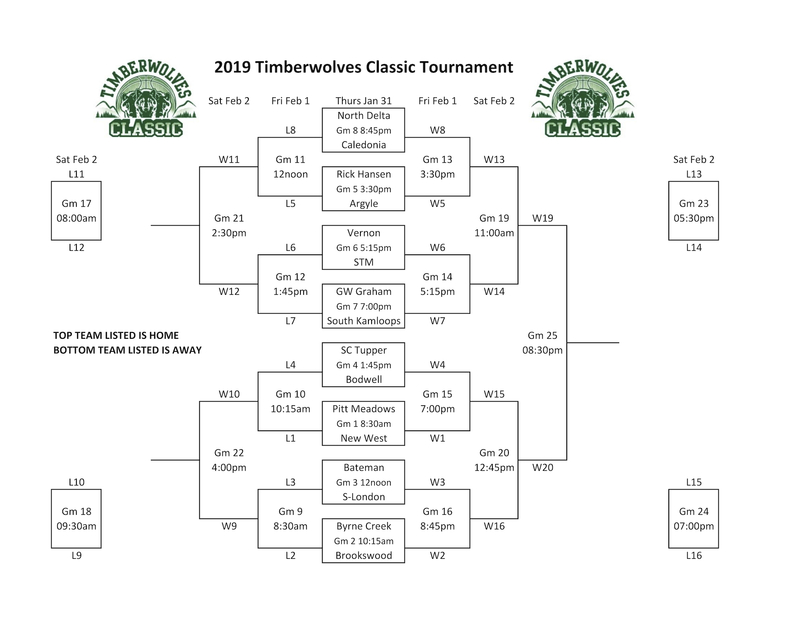 2-ranked senior boys Triple-A basketball team, this week in Abbotsford for a three-day run beginning Thursday at the 16-team Robert Bateman Timberwolves Classic (full tournament draw below). Instead, history has been resurrected solely to illustrate just how rare it is to find, at the championship levels of senior varsity sports in this province, a group of student-athletes talented and committed enough to give themselves a shot at such an elusive double. First, let’s get the particulars out of the way. Back in December of 2011, the Mission Roadrunners won the senior varsity Double-A Subway Bowl provincial football title. Then, in March of 2012, its senior boys basketball team found the same final result, winning the B.C. senior varsity Double-A hoops title in what was then a three-tiered province. The Richmond Colts won the Triple-A football Subway Bowl crown in 1997, then in the spring of 1998 beat Vancouver College in the top-tiered Triple A B.C. basketball final. Ask Vernon head basketball coach Malcolm Reid about the challenges and the rewards of working with a group of Panthers’ athletes striving for such dual excellence, and the Vancouver College alum, who played in the late 1980s, instantly reveals his glass half-full mentality. “Football gives us a late start, so by this time of the season, we will not have played as many games as the rest of the teams in the province,” said Reid by phone Tuesday of the fact that the school won its first-ever Subway Bowl senior football title on Dec. 1, about a week into the basketball season. The Panthers are young, fresh and rising. And if the changing of the calendar to February makes teams grip their future a little more tightly, in Vernon Secondary’s case, it’s more a matter of trusting that there will be an intangible carryover from the hot August days of fall football camp to the path that leads to March Madness. If the Vernon Panthers seem about as anonymous a No. 2-ranked team as you’re apt to find in B.C., you don’t need to doubt their credentials. Last season, as a No. 11 seed at the B.C. junior varsity basketball championships, they completed their first day of play at the Langley Events Centre by eliminating the No. 6-ranked and defending B.C. JV champs from Burnaby South 55-46. In that game, Vernon got 19 points from forward Kevin Morgan, 14 more from Zack Smith, and 11 more from Trent Charlton. Smith and Charlton, along with Liam Reid, not only played on Vernon’s 2017 B.C. JV football championship team, but also on this past fall’s senior varsity championship football team. Add to that, the fact that Morgan and Isaiah Ondrik only gave up football this season, and you see a chemistry-laden group of athletes — including the likes of Jimmy Atwal and Saajan Klair — who have risen up through the ranks together in their Okanagan region. At last season’s B.C. junior varsity basketball championships, Vernon had its run to the title snuffed by a 62-57 quarterfinal loss in overtime to eventual tournament finalist Lord Tweedsmuir, otherwise the up-country Panthers might have had a chance to not only win provincial back-to-back age-group championships in football, but in basketball as well. With that kind of experience and pedigree, head coach Reid admits there is a built-in maturity within his group, one which is stationed to come back even stronger next season. 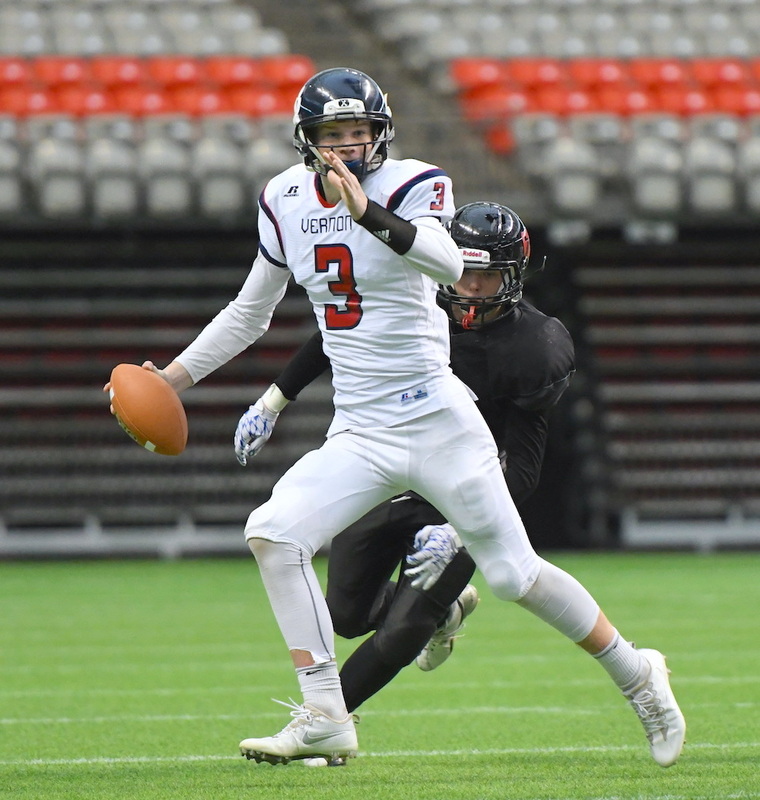 “Winning the senior (football) title was significant,” said Reid, who is ably assisted by the school’s head football coach Sean Smith, as well as former longtime Vancouver College head basketball coach Bob Corbett. “It gave our school and our town some nice notoriety, and in some ways, I think the kids were caught off guard by how big a deal they saw it was. People were proud and patting them on the back. Without question, Reid’s read on the situation is bang on. The Vernon football team was a wire-to-wire No. 1 at their tier and the clear favourite, something it showed in its 48-12 win over Robert Bateman in the title tilt at B.C. Place Stadium. When that same school hosts them as part of this weekend’s Timberwolves Classic, however, the Panthers will be in a different position, attempting to play their best basketball of the campaign against a flurry of fellow top-ranked foes, the likes of which they have not seen this season. The Panthers (14-1) beat current No. 8 Rick Hansen 66-60 in the semifinals of the Hurricanes’ own invitational back on Dec. 20. On that day, Rick Hansen came into the game with 11 games of experience under its belt, while the Panthers had played just twice. Depending on what happens, Vernon could, for the first time this season, face some combination of No. 1 Tupper, No. 3 North Delta, No. 9 G.W. Graham and No. 10 Byrne Creek at this weekend’s event. “It’s about getting good games,” says Reid of the Timberwolves Classic, where his Panthers open play Thursday (5:15 p.m.) against Burnaby’s St. Thomas More Knights. Every team wants to play to its unique strengths, and when it comes to Vernon, it comes down to their positional duality and their team toughness. Yet if the Panthers are arriving a year ahead of their time, as their lofty ranking would seem to indicate, they have self-admittedly not yet faced the gauntlet of provincial Triple A powers who make up the Bateman tourney’s field. “The Bateman tournament is going to let us know where we stand because right now, even we don’t know,” said Reid. 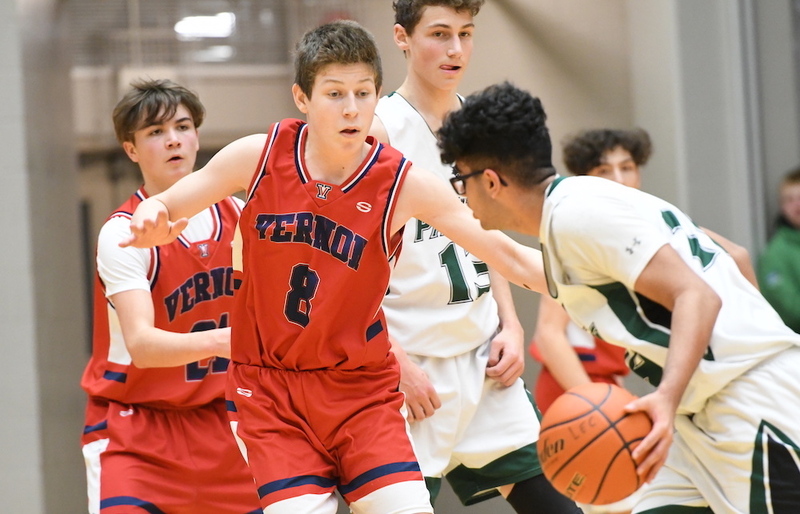 As we said off the top, the Panthers’ two-sport pedigree and their current spot in the provincial Triple-A basketball rankings can’t help but harken the history of our province’s most accomplished basketball/football teams. Yet there is also a standard of excellence within its own basketball program that serves as an inspiration. The 1985-86 Vernon Panthers, led by one B.C.’s greatest players ever — J.D.Jackson — advanced all the way to the finals of the B.C. Triple A tournament at the PNE Agrodome where its magical run was extinguished by the powerhouse Maple Ridge Ramblers. All of that may have taken place 33 years ago, but Reid, now a Vernon resident, is well-versed in how good that Panthers’ team was with the UBC-bound Jackson at the controls. A 1988 Vancouver College grad, Reid had his own thrill of helping the Fighting Irish to the top-tiered Triple-A final four that season, one which culminated with a repeat title victory by a Richmond Colts team picked the greatest in B.C. high school history. Yet as an eighth grader, he saw Jackson’s Kalamalka squad top Kitsilano for the 1984 B.C. 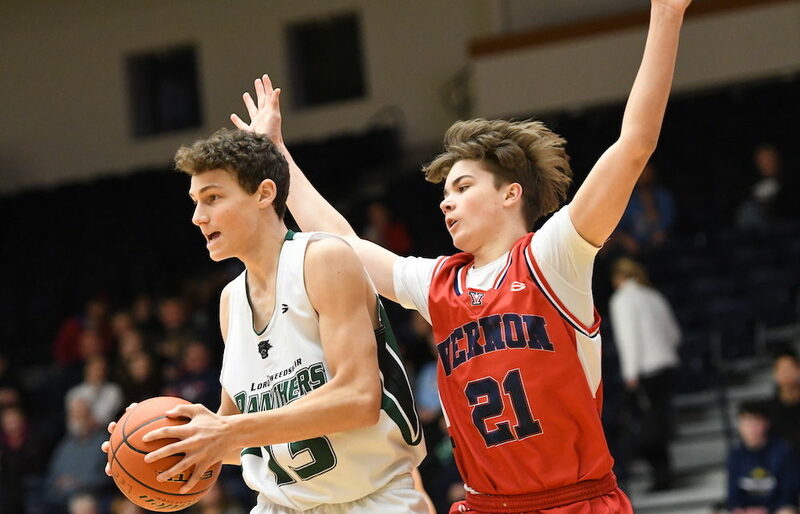 JV title, then two years later as a 10th grader, saw Jackson carry the Vernon torch again, this time in its 77-71 loss to Maple Ridge in the aforementioned 1986 senior final. Players of Jackson’s ilk, a two-time CIAU Player of the Year (1991, 92), are generational talents. Yet Vernon Secondary’s current success in football, and boys (No. 2 Triple-A) and girls (No. 6 Double-A) basketball can stand against any period in the history of its school’s athletic department. All of that said, these 2018-19 senior boys Panthers are one of the youngest teams you’re likely to bump into over the course of your basketball travels this season. With that in mind, its seasoned coaching staff is working hard to not only keep that growth pattern on track, but to also make sure they are playing their best basketball by the time the provincial championships come to the Langley Events Centre in March. If you’re reading this story or viewing these photos on any website other than one belonging to a university athletic department, it has been taken without appropriate permission. In these challenging times, true journalism will survive only through your dedicated support and loyalty. VarsityLetters.ca and all of its exclusive content has been created to serve B.C.’s high school and university sports community with hard work, integrity and respect. Feel free to drop us a line any time at howardtsumura@gmail.com. 01.30.19 B.C. JV boys basketball Big 10 rankings: No. 1 Burnaby South carries No. 1 into the February Frenzy!